We know you’re busy. Really, really busy. And you have all sorts of things to worry about. We don’t want sales contest ideas to be one of those things. Check it out to get 10 full sales contest plans, which outline everything from sales contest names to point structures and even sales incentive suggestions. The contests also come with tips, so you’ll understand how to leverage them in your own specific sales environment. Where to Start: Want to get new sales reps in the game quicker? Pick 1-2 of your main products or services that are relatively easy to understand for a new rep and also have high value for prospects. Incentive: Some sort of “trophy” the winner can place on their desk. Then, if the new rep feels overwhelmed at any point during onboarding, they’ll have something positive to catch their eye from time to time. Okay, now it’s time to check out the other 9 ideas. 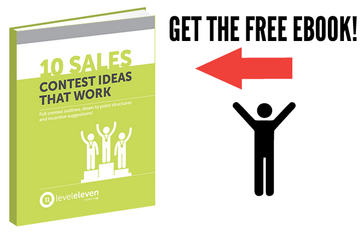 This eBook shares 10 sales contest ideas that work. You'll get contest names, sales incentive suggestions, point structures and team formats for each idea!